How Often Do You Need to Change a Garbage Disposal? Garbage disposals are very useful for eliminating food waste by washing it directly down the sink and out into a city's sanitation system. The blades of the disposal chop food remnants into bits small enough to wash through the pipes without clogging them. Blades, however, will become dull and lose their functionality over time. Multiple factors, including how often you use the disposal and the types of food you wash down it, play into when you need to replace a disposal. The garbage disposal unit is housed directly under the kitchen sink. Your garbage disposal will wear out much faster if you flush chicken bones, coffee grounds or any other materials that can generally be considered hard down the drain while it is running. These items dull the blades of the unit and can also completely jam the grinder or cause it to stop working completely. Avoid pouring corrosive chemicals like bleach, ammonia or drain cleaner down the drain since they can corrode the system and force an early replacement as well. Flush only soft or thin, biodegradable debris down the drain, such as egg shells, bread, small amounts of meat, soft vegetables, rice and cereal. Always have the water on when flushing food down the disposal and whenever the disposal is running--water helps to lubricate the mechanism, saving wear and tear on the blades and grinders. Use cold water, too, to prevent fats from melting inside the housing. Fats coagulate when they cool and can clog the pipes or the disposal itself. If a fork or some other undesired object accidentally falls down the disposal, ensure the power is off and then try to fish it out using a pair of tongs--never stick your hand into the disposal. Odors can build up in a disposal if food bits begin decomposing inside it. Prevent this by regularly pouring a small amount of white vinegar down the drain and then rinsing it out with water a few minutes later. An average garbage disposal is expected to last between 10 to 12 years if it is properly maintained. Many disposal companies offer warranties for up to two years after installation. After about 10 years, even a perfectly maintained disposal will start suffering from dull blades if it has been used on a regular basis. 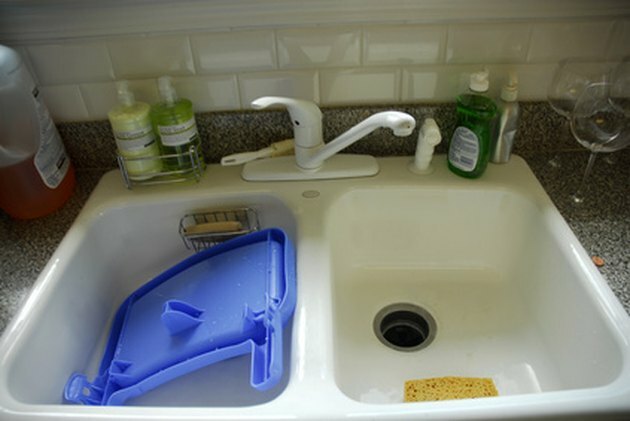 If the disposal starts jamming regularly or is not clearing the food out of the drain effectively--which you'll know once odor starts becoming a more frequent problem--you should have the disposal examined by a professional serviceman and/or replaced. Do Eggshells Sharpen a Garbage Disposal? What Can & Can't Go Down a Garbage Disposal?